2014 is the first year where roughly 50% of graduating high school seniors across the United States are so-called “minorities.” They’re most likely (the future of) your consumers, and more importantly, your workforce. Before you get ahead of yourself and wonder about their needs and wants, what drives them, and what they need to thrive, you need them inside your company first. This panel will focus specifically on building successful pipeline programs that incorporates local communities and reflect the diversity of this country. Walk away with tangible ideas and facts to make the case for your program. Dexter Thomas is a culture writer and social media specialist at the Los Angeles Times, as well as a PhD Candidate in East Asian Studies at Cornell University. He has taught media studies and Japanese, and is writing a book about Japanese hip-hop. He began working in new media as a Student Director of Programming at KUCR 88.3 FM, independently producing podcasts as well as music and news programs. He has written for several outlets internationally on topics as diverse as social justice, Internet and youth culture, and videogames. Jamie Talbot is a senior engineer at Medium in San Francisco, where he has been working towards building a platform that moves thinking forward for the last three years. He has worked on or led the engineering teams on a number of projects, including the ones that implemented support for custom domains, passwordless login, and the public API. Working with three other colleagues, he created the role of Diversity Advocate, whose purpose is to work internally and externally towards an organisational makeup that is more representative of the country's wider demographic. He currently holds this role, along with two colleagues who are not straight white men. Jamie has worked extensively with CODE2040, the non-profit organisation that aims to improve access to the technology industry for Black and Latino/a students. He established Medium's partnership with CODE2040 for their fellows program, which resulted in three interns joining Medium for the summer of 2015. Medium will repeat this program in 2016 with three new fellows. Jamie also helps out with CODE2040 on an independent basis, mentoring students and traveling around the country to provide advice and guidance as part of CODE2040's TAP retreats. He maintains a standing weekday appointment which he uses to provide free mock interviews to underrepresented computer science students who want to pursue a career in technology. Having received every benefit in life, he is determined to see the opportunity to succeed extended to all. Prior to Medium, Jamie worked at StumbleUpon, and before that in Australia. The United States is the fourth country he's lived in. Karla Monterroso is committed to closing the opportunity gap for Blacks and Latinos in the United States. She works for CODE2040, an organization that works to get Blacks and Latinos in the innovation economy through internships, applicant prep, entrepreneur, and company programs. 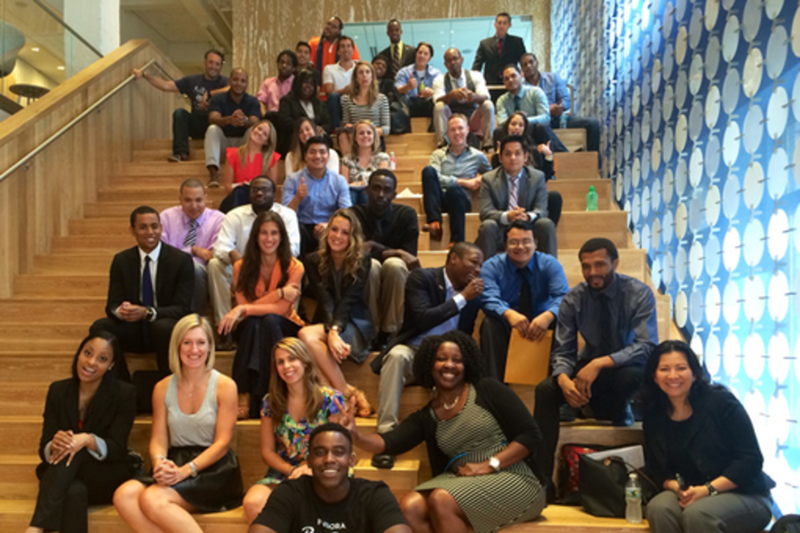 CODE2040 has worked with 70+ companies and 1000+ students to diversify the technology sector. Karla has focused much of her professional life in growing the people and program functions of rapidly scaling social enterprises driving youth advocacy and leadership. Prior to joining CODE2040, Karla was the National Director of Advocate Engagement for Health Leads. Health Leads, a national non-profit changing health care by ensuring hospitals address the intersection of poverty and health. In her most recent role, she developed the national training standards, structure, curriculum; recruitment systems; and performance management tools that will allow Health Leads to scale. As their Director of Talent, she tripled the staff team within two years and grew the operations that impacted employee recruitment, performance, and engagement. She is currently a board member for tech non-profit One Degree (1deg.org). Karla has spent the last 14 years working for underserved communities. She enjoys the art of group and team facilitation, has a natural aptitude for organizational development and change management, and believes fervently in the cultivation of organization culture. Karla's passion for equity and social justice comes from her upbringing in a low-income community with parents who dedicated their lives to making sure she was the first in her family to go to and graduate college. Karla is an alumnus of the University of Southern California. Sarah Wagener is the Vice President of Talent Acquisition & Diversity at Pandora, bringing over 18 years of experience developing talent strategies and scaling companies. Sarah is focused on building Pandora's recruiting engine, brand and diversity practice during a time of high-growth and geographic expansion. Prior to joining Pandora, she was part of Facebook’s Recruiting Leadership Team driving their national technical sourcing strategy. Before Facebook, Sarah was Senior Director of Staffing at Genentech, where she oversaw recruitment for Roche Pharmaceuticals in North America, developed enterprise-wide HR strategies and operationalized staffing solutions. Sarah holds a Bachelor of Arts in journalism from Humboldt State University in Arcata, California.